LED backlighting is energy efficient to reduce a business' carbon footprint. Posters slide between the acrylic backer and acrylic overlay to create a 3/8" thick signage panel. Cable system included for suspending the lightup poster frame in a window. Metal hanging fixtures have a satin silver finish, which subtly accents the panel. This light box sign that is suspended from the ceiling will revolutionize the way businesses advertise! A slim construction, measuring only 3/8" thick, makes this backlit poster holder innovative and futuristic! Restaurants and retailers are constantly searching for new ways to capture walk-in business, and this light box sign for windows is just what is needed to generate more revenue! Not only will this window display bring new life to any storefront advertising campaign, but it sells for a surprisingly affordable price. The light box sign that holds menus is essentially two acrylic panels fixed together with decorative black hardware. The 1/4" thick backer contains the LED lighting components, while the acrylic overlay is only 1/8" thick. The fact that the illumination emanates from LED lighting, not neon or fluorescent bulbs, makes this window display a light box sign that is energy efficient. 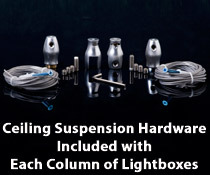 A cable suspension system for hanging each panel from the ceiling is included. The light box sign that is suspended can be placed practically anywhere, offering much more flexibility than traditional wall-mounted backlit panels. The metal cable system components have a satin silver finish, which creates a captivating contrast with the black border of the acrylic overlay. Each illuminated poster holder, light box sign comes with two 16' coils of steel wire. The long cables allow businesses to hang the panel in a variety of locations such as in a window, behind a checkout counter, or simply over a walkway. The signage clamps suspend the signs by gripping them with setscrews, so users need not drill holes in the poster panels. A combination of energy efficient LED lighting, cutting-edge design and cable suspension system makes this window display an incredible bargain, in addition to being incredibly effective at capture new customers! Please Note: The panel clamps have a maximum cable capability of 2mm. The available compatible replacement cables on this site are CABLE5M, CABLE25M, CSCABLE15 and CSCABLE75.